The Wauseon Rotary Club recently presented $1,000 to each of the Wauseon school district’s principals. The Rotary has encouraged them to use the funds for student field trips, most notably to the Museum of Fulton County. In past years, the schools have used Rotary Club donations to support the elementary school food pantry and the district’s service dog. Pictured are, from left, Joe Friess, middle school; Blake Young, primary school; Rotary Club President Bill Drummer; Keith Leatherman, high school; Ryan O’Dell, high school assistant principal; and Theresa Vietmeier elementary school. 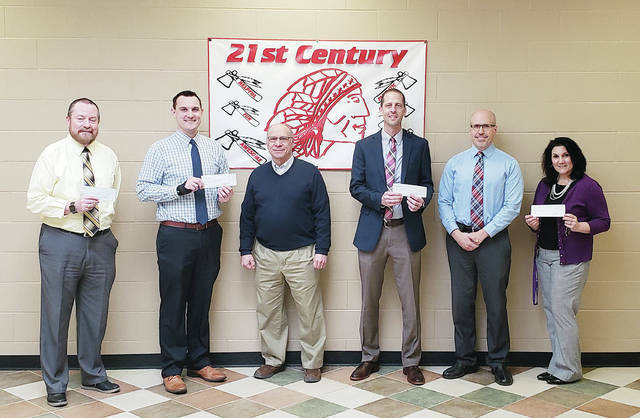 https://www.fcnews.org/wp-content/uploads/sites/45/2019/03/web1_Chamber-checks.jpgThe Wauseon Rotary Club recently presented $1,000 to each of the Wauseon school district’s principals. The Rotary has encouraged them to use the funds for student field trips, most notably to the Museum of Fulton County. In past years, the schools have used Rotary Club donations to support the elementary school food pantry and the district’s service dog. Pictured are, from left, Joe Friess, middle school; Blake Young, primary school; Rotary Club President Bill Drummer; Keith Leatherman, high school; Ryan O’Dell, high school assistant principal; and Theresa Vietmeier elementary school.